First, you'll need a glass container. I bought this 4" cylinder vase from Michaels for $4. I learned from EnkoreMakeup's video on youtube that the stuff Sephora uses in their containers is called Colorfill vase filler and you can find a 1 lb. bag of it at Michaels or Hobby Lobby for about $6. There are several brands of glass paint you can use, just make sure it specifies that it is for glass. I used Pébéo Vitrea brand paint from Michaels with a couple generic brushes that I already had on hand. If you prefer not to mess with brushes, you can use Permenamel Accent Liners which have nozzle applicators. I had a jar of glass conditioner which will prepare the surface for painting, but you can use rubbing alcohol to clean the glass, instead. Lastly, you need a computer and printer (doesn't need to be color). 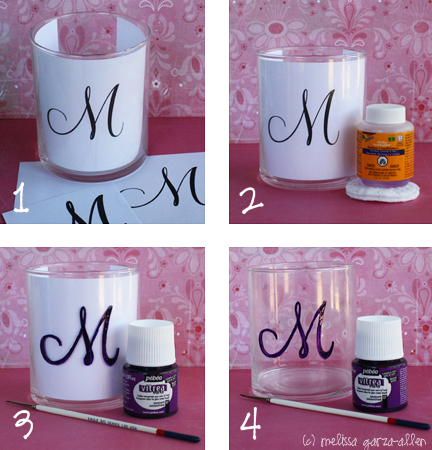 1) Measure your glass container and determine the size of your monogram. My initial is about 2" tall with a 1" margin from the top and bottom of the vase. In Word or Illustrator, create a document and place the monogram at the bottom of the page with the margin you determined. For example, on mine there is an inch of space from the bottom edge of the paper to the bottom of the "M". Print the document out, and trim the top of the page so it fits neatly inside the glass without sticking out. Use a couple pieces of tape to secure the paper so it doesn't wiggle around. Note: Don't cut out the initial or you'll have a hard time centering it on the glass without it being crooked. 2) If you are using Delta Permenamel glass paint, you need to use their glass surface conditioner because it has some kind of super special magical ingredients that help the paint adhere. If you use another brand like I did, you can just use rubbing alcohol to get rid of any oil or dirt on the glass' surface. Once you've done that, don't touch that area because you will leave behind oil from your fingers. 3) Using paint and a brush, or a squeeze tube, trace and fill in the initial as it appears on the paper underneath. 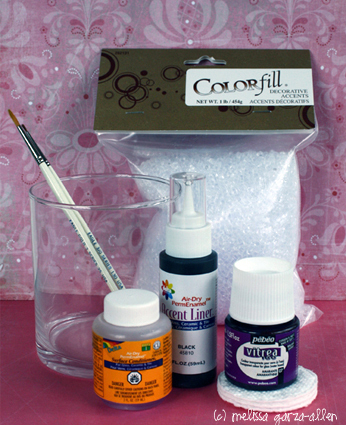 4) Remove the paper stencil from the inside of the container and fill in any uneven spots on your initial. If you want to add more coats just wait about 20 minutes between each one so the paint doesn't get gloppy. Note: Read the instructions on your bottle of paint. While some paints like Delta Air Dry Permenamel are dishwasher/microwave safe after 24 hours, others require you to bake the piece or apply some kind of glaze on top of the paint. 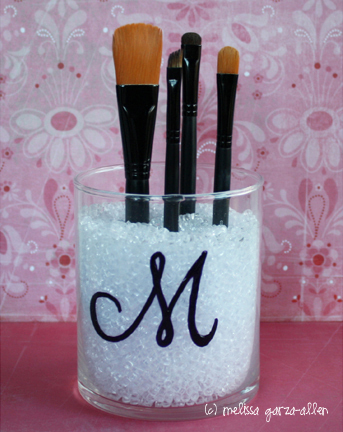 Fill your glass container with Colorfill, stick your brushes in and ta da! You can now show off your beauty tool collection in your lovely Sephora-inspired, makeup brush holder that doesn't look like a clumsy arts & crafts project! P.S. When I was searching for EnkoreMakeup's video, I found a bunch of diy brush holders that were very "trash to treasure". There were votive holders, acrylic boxes, apothecary jars and Mason jars filled with everything from coffee beans (hello smell!) and fish tank gravel, to colored sand (hello mess!) and popcorn kernels. Can you imagine? One Pretty Thing's Daily DIY Roundup. 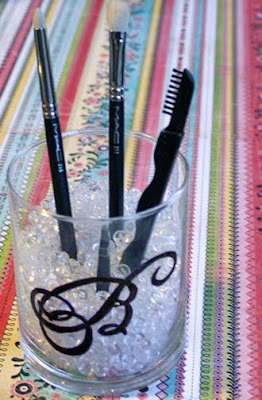 Oh, I love that - it makes me want to find a place to put my make up brushes like that! So cute, cute! Too Cute! Love your blog design.. your little chicks and labels are adorable! 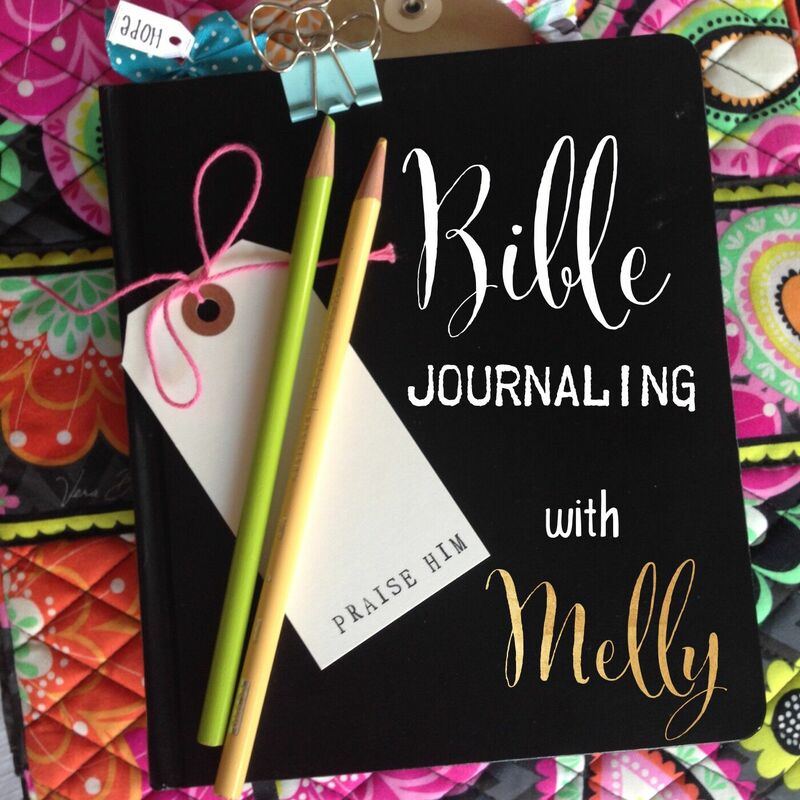 Thanks for linking up at Unwasted Homemaking Party!